It was hard enough to get it out of the apartment after she created it nearly 50 years ago. 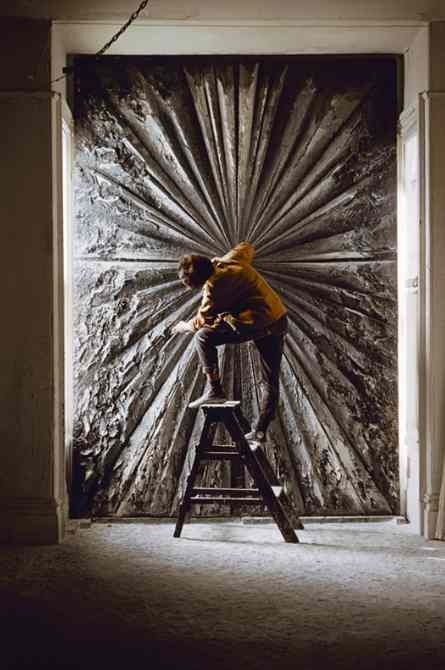 Get to The Whitney’s show Jay DeFeo: A Retrospective this week before the moving crews come back. 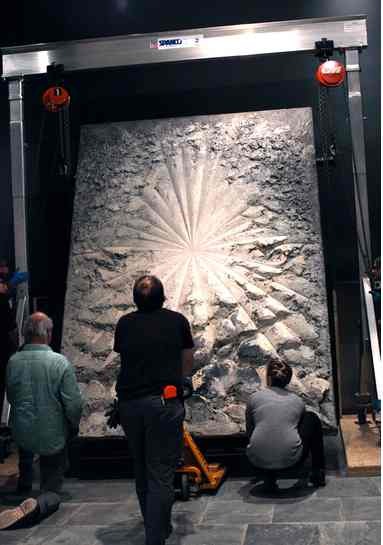 The Rose, DeFeo’s legendary painting (or is it a sculpture?) is the focal point of this Bay Area artist’s exhibition. 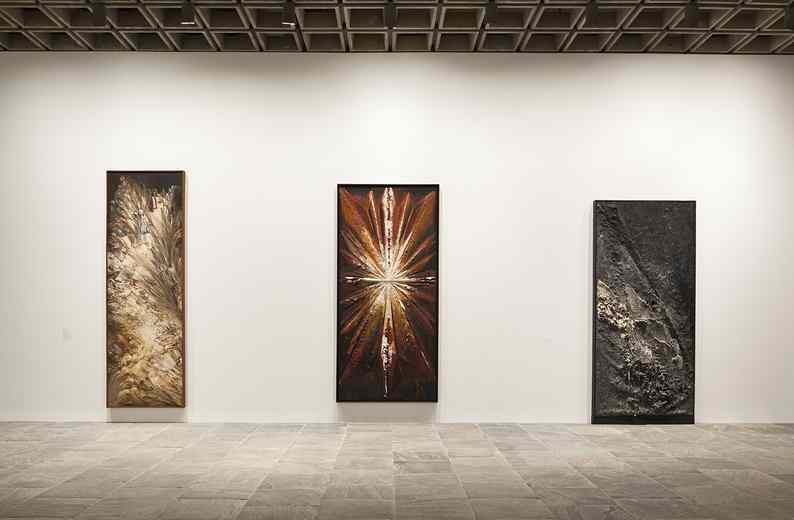 Early in her career, DeFeo drew inspiration from prehistoric art, the cosmos, and terrestrial forces of nature. In the late 1950s and early 1960s, she painstakingly built up the surfaces of her oil paintings, which often evoked geologic forces – slow, large-scale shifts of monumental proportion. (See the installation view of three of these works). DeFeo was invited to show at MoMA in the historic, 1959 all-star show, Sixteen Americans, which included Rauchenberg, Johns, Kelly, Stella, de Kooning and Nevelson. She sent some of her 3D impasto works, but didn’t consider her largest piece, The Rose, quite finished. She became obsessed and spent six more years layering paint on the canvas. Listen to DeFeo herself talk about the difficulty in creating the 3D effects in The Rose in a drafty apartment in the late 1950s. The Whitney removed the side panels of The Rose and used a two-ton gantry to get it as close to the wall as possible. Source: Whitney Museum. Photo: Paula Court. Unfortunately, she couldn’t even get it out of her apartment, because the 3D surface she created ended up being too big to fit through the door and weighing…oh, about a ton. DeFeo had a small army of movers come upstairs to her apartment-studio, rip out the wall, and lower it to the street with a forklift. Watch and listen to Bruce Connor’s take on how it all came down in his interview with SFMoMA). After that, The Rose went on display in California, but ultimately was installed as the showpiece of a conference room at the San Francisco Art Institute. For all the right reasons, temporary wall was built to conceal and protect it, but ultimately The Rose was hidden from view from 1979 until 1995, when the Whitney team unearthed it. Now, they own it. Recently, the Whitney had the task of getting a truly monumental work out of storage, shipping it to the West Coast for the SF edition of the show, and bringing it back to New York. Recently, The Rose arrived back at the Whitney from the show’s run at the San Francisco Museum of Modern Art. It’s one of the most complicated pieces for the museum to ship, move, and install – just like the original transfer. Click on this link and scroll down to find the Whitney’s photo show of what it took to get it up to the Fourth Floor. See how a crew of handlers got a one-ton work from the street to the gallery. Get to the show before it closes June 2, and enjoy DeFeo’s jewelry, geology-inspired work, drawings, and never-before-seen photos of this Beat-era innovator. This entry was posted in Art, History, Museums and tagged art, history, museums, painting by mssusanb. Bookmark the permalink.